Bowlers who came out to Pin Chasers Midtown on April 8th to support Bowl For Kids’ Sake got the chance to meet the Buccaneers player. Bowl For Kids’ Sake is Big Brothers Big Sisters’ signature fundraiser, raising over $200,000 annually for children in need across Tampa Bay. It’s a fun and easy way to positively impact a child’s life. Because of Bowl For Kids’ Sake, more Bigs and Littles can be paired up, more friendships can be created, and improved outlooks on life can be started. Tampa Bay Buccaneers player Lavonte David came out on Sunday, April 8th to Pin Chasers Midtown to show his support for Big Brothers Big Sisters of Tampa Bay’s Bowl For Kids’ Sake. Fundraisers got the chance to meet the player and get their photos taken with the linebacker. 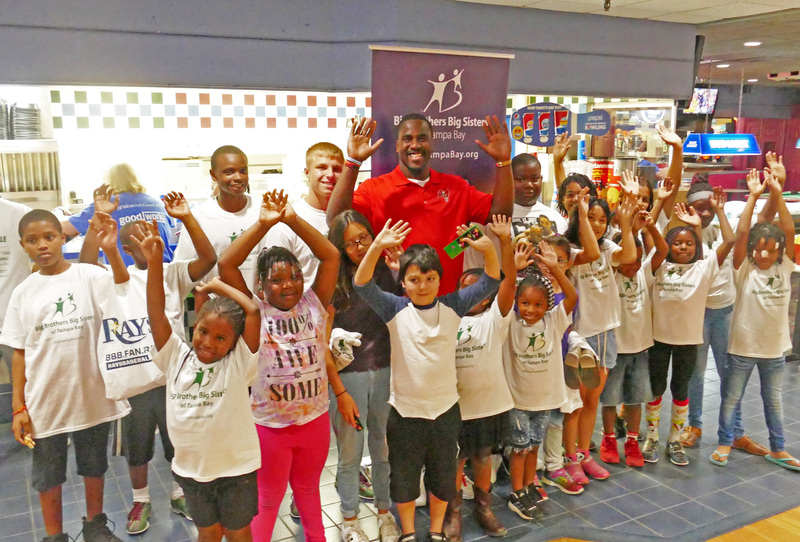 Lavonte David even took the time to bowl a few frames while speaking about the importance of supporting the one-to-one mentoring relationships that Big Brothers Big Sisters of Tampa Bay provides children in our community. During the event, Lavonte David was presented with a thank you gift from our Matches for providing tickets to every Buccaneers home game during the 2017-2018 football season. Lavonte also went Live on the Big Brothers Big Sisters of Tampa Bay’s Facebook page calling for others to support our mission of providing children facing adversity with strong, enduring one-to-one relationships that change their lives for the better, forever. 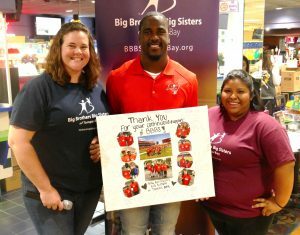 Thank you to Lavonte David and the Tampa Bay Buccaneers for being such great supporters of Big Brothers Big Sisters of Tampa Bay! View Lavonte David’s Facebook Live video here. View all of the photos from the April 8th Bowl For Kids’ Sake event here.